Robyn: Maryse…FYI….Adriana Lockes second Gibson Boys book, Craft, just dropped on Amazon. The first book Crank was hilarious. Can’t wait to read Craft. <— HAPPY NEW RELEASE DAY & today is the day!! Take a look at the latest J.R. Ward Black Dagger Brotherhood story (Dearest Ivie) that just went live, and I love the premise of this one. It may not be a full length book like her usual, but even her short stories are loaded in oomph, and this one sounds like her old-school angsty romance (he’s an aristocrat, and she’s a nurse and the daughter of a biker and they meet in a bar). 😉 *rubs hands together with glee* Tee hee!!! Also if you missed it, check out my latest book review of “At This Moment” (super-romance-angst rock star read and yep. I’m now on book #2. YAY ME!!!). P.P.S. Let me know if I’m missing any or if you loved any (from this list or elsewhere). 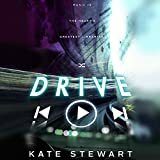 Drive by Kate Stewart <— ONE OF MY 5-STAR FAVORITES now available in audiobook! Marriage of Inconvenience: Knitting in the City, Book 7 by Penny Reid <— PENNY REID’s latest is now ALSO available in audiobook!! She’s a billionaire heiress that has to get married. Broken: Broken #1 by A.E. Murphy <—HE’S GOT A PHOBIA… Rominew recommends this one! Rominew: one of my faves is BROKEN by A.E. Murphy. It’s gripping, with many twists and the author described the pain the main character was going through in such a way that I couldn’t help but feel for her. And just when I thought that there wouldn’t be more desolation, the second book proves you wrong: you empathize with somebody else. Samantha: Broken by A. E. Murphy—HOLYYYYYYYYYYY CRAP!! Fantastic, and weird, and angsty, and so sad. Can’t wait to get started on the 2nd one! Worth a read you guys!!! The Chosen: A Novel of the Black Dagger Brotherhood by J.R. WARD <— J.R. WARD’S LATEST FROM LAST APRIL is super-bargain priced right now! Don’t forget she’s got a new one that just went live today! Sharon: I read The Chosen (loved it!!!) and what and I doing now? Another reread. But just starting back at Lover Mine. I am so hopeless – wait – that’s another reread! Help, Help, Help! Ruby: THE BEST vamp series EVER written, The Black Dagger Brotherhood! I have been obsessed with these guys (AND their women!) since the very first book and as long as JR keeps it going, I will continue reading them! Suze: LOVED The Chosen. 500 plus pages flew by. Knights of Black Swan by Victoria Danann <— BEST IRISHMAN IN A FANTASY SERIES ALERT! MichelleS loves HIM the most! MichelleS: …I’d like to nominate Rammel Hawking as the BEST IRISHMAN in a fantasy series… since St Paddy’s Day is next Sunday… maybe Maryse will do an Irish theme post? That’s also why I picked up First Time Lucky. Irish brogue gets me every time, lassies. A Little Luck (The Lucky Series Book 4) by Jill Sanders <— JILL SANDERS ALERT!!! Alphas Like Us (Like Us Series: Billionaires & Bodyguards Book 3) by Krista Ritchie and Becca Ritchie <— M/M ROMANCE ALERT!! Twisted and Tied (Marshals Book 4) by Mary Calmes <— M/M ROMANCE ALERT!! Running to You by Andrew Grey <— M/M ROMANCE ALERT!! Good morning! Trying to get caught up on BDB so that I can read Dearest Ivie! Good morning! LOVED Brightest Sunset. That one had me in tears at one point. So good! I’m just re-reading today. Last night I was so tired, I couldn’t comprehend words. So, after Brightest, I started re-reading Trickery. 😀 The story makes me happy and is full of humor. Also, it has much less angst than Brightest. Maryse you do need the Viki app so you can watch Healer. The bathrooms I can’t help you with. Small St. Patrick’s day fun. 2. Will you wear green? 3. Would you kiss the Blarney Stone? 4. Would you kiss Colin Farrell? 5. Name a book that you read set in Ireland? 6. A book in your tbr with a green cover. 7. Link a song about Ireland or an Irish artist or etc….. can think of a few lol. 1. Corned beef? <--- HECK YES!!!! YUMMMMMY!!! 2. Will you wear green? Depends on if I remember it's St. Patrick's Day. 😉 3. Would you kiss the Blarney Stone? Don't even know what that is, but why not? 4. Would you kiss Colin Farrell? <--- HECK YES. <3 5. Name a book that you read set in Ireland? Fever Series!!!!!! 6. A book in your tbr with a green cover. Heir of Fire and Trespassing 7. Link a song about Ireland or an Irish artist or etc….. can think of a few lol. For sure Damien Rice. Love of my music life! 1. Yes. And the potatoes? Yum. 2. Maybe not. Hmm. Do I have green pjs to be lazy in. 3. Yes. Give me a silver tongue. 4. When I first saw him on Tigerland I would. Now, hmm. Still handsome though. 5. Nora Roberts has an Irish Trilogy set, starting with Jewels of the Sun. I enjoyed all three. 6. Love and Other Alien Experiences by Kerry Winfrey. 4. Would you kiss Colin Farrell? Nope. 1. Corned beef? AND CABBAGE AND CARROTS = LOVE we’re actually having a St. Patty’s Day lunch at work on Friday! Ela, you read the Fever series too. I think almost everyone can claim that one. That is true Tessa! I saw it on Maryse’s and was like yeah…me too! 4. Would you kiss Colin Farrell? Oh, yes! 5. Name a book that you read set in Ireland? Fever, fever, fever! 2. Will you wear green? I’ll try to remember. 3. Would you kiss the Blarney Stone? Why not!? 4. Would you kiss Colin Farrell? No. Who knows where that mouth has been. 1. Corned beef? Of course!! 6. A book in your tbr with a green cover. Spoiler Alert: The Hero Dies. 7. Link a song about Ireland or an Irish artist or etc….. can think of a few lol. That just made my brain fry a little, so I’m abstaining from this one! 3. Would you kiss the Blarney Stone? Sure (if I don’t have to wait in line to do it)! Be back later with me answers too. I am mopping up my tears from watching Scandal. I have a soft spot for Huck and the “752, 752,752” epi just killed me. I love bev’s questions and reading everyone’s answers! 2. Will you wear green? Yep! St Patty’s day scrubs. 7. Link a song about Ireland or an Irish artist or etc…1. Corned beef? Amy I’m excited but I need you to watch it. Lol. I’m like obsessed, so be gentle. Honest , but kind. 1. Corned beef? NO! Yuck!!! 2. Will you wear green? Yes, just boring green scrubs. 6. A book in your tbr with a green cover. Have to look this up when I get home. 7. Link a song about Ireland or an Irish artist or etc. Anything U2. *high fives Cheryl* Finally someone in agreement about C&C! Amy – I love that song! 1. Corned beef? Heck Ya!! My favorite is corned beef, potatoes, carrots and cabbage. I think I might make it into a soup this time with Irish Soda bread! 3. Would you kiss the Blarney Stone? That’s a definite heck NO! To many skanky lips kissing that rock! YUCK! 5. Name a book that you read set in Ireland? The Slater Brothers series by L A Casey and of course Fever! 7. Link a song about Ireland or an Irish artist or etc….. can think of a few lol. Oh gosh, the only song that comes to mind and now keeps playing on repeat in my head is Christmas in Kalarney. I sang that in a Christmas show in elementary school and still know it! The holly green, the Ivy green, the prettiest picture you’ve ever seen, it Christmas in Kalarney with all of the folks at home……. Maryse…FYI….Adriana Lockes second Gibson Boys book, Craft, just dropped on Amazon. The first book Crank was hilarious. Can’t wait to read Craft. 3) Yep, I’d kiss the blarney stone… with a piece of parchment paper between my lips and the stone. 5) Fever series… cheating by using everyone else’s answer! Because Barrons! Ooh lots of people playing. Maryse I think Amy and Kooloo are trying to kill me from suspense. Did Grey just ask what corned beef is??? MichelleS…right?? SO much emotion in his voice, especially when it peaks right after the 2:30 mark. GAH! BEV!! I watched it, and I can see the appeal! And yes, I will be continuing it and will even get hubby to watch it with me. He tends to like foreign language movies so he’ll probably like this series. You know who I loved? That woman Ajumman. She reminded me of the CNA (in looks and the way she spoke) when I was in the hospital who “helped” me clean up on my second day there by stripping me down in the bathroom and using bathing cloths on me while I stood there naked and in shock. LOL! Wait, WHAT?!? Grey has never had corned beef?? YAY!! For me it really takes off in the 3rd ep. I LOVE Ahjumma. Her and Healer’s relationship is awesome too. Thank you for trying it. YAY! Maryse, if you kiss the Blarney Stone it gives you the gift of ….well….blarney, lol. You will have a silver tongue. Supposedly. This is totally us now….the end is what happens when I hug too much. I GOT MY HUG FROM BEV!!!!! Oh my…@0:17 is totally me and you (I’m the orangutan) all the times I’ve tried to hug you before. But that is TOTALLY you as the orangutan at the end, LOL!!! Ok now I’ve got to finish Author Anonymous thanks to my Leslieloooo! bev… yes! Grey DID ask that? Crazy right?!! And I asked what the Stone was. What does a silver tongue do? Do I want one?? bev I forgot to tell you but I’m hooked on HEALER!!!! I do. The gift of good speech. Be witty, and charming, and talk people around. Well, that makes it sound like I want to be a con artist which I don’t. It is Amy. You and your flying hugs. I love the heroine. Yes, her backstory. And yet how she grew up. But that is still under there. Seriously, not a book but know it will be one of my favorite stories this year. One of my favorite H & h, separately and together. And favorite side characters. 1. Corned beef? Nope! Smell of cabbage gags me. 2. Will you wear green? Nope, but only because all I own is black. 3. Would you kiss the Blarney Stone? Yes!! I would kiss everyone within a mile radius because I was so happy to have traveled to Ireland. 4. Would you kiss Colin Farrell? Hot Irish guy?? Heck yes!! I hope you have a great day. Also, that this next year is filled with good books, conversation, and lots and lots of laughter. Cheryl!!! Your birthday is Pi day?!?! That’s epic!!! Happy birthday!!!! *tosses all of the birthday confetti* and promptly sets about making a birthday pie! There’s a character named Bong Soon? LOL. I scrolled down and saw that and thought it was what you were DOING today! Ha! “Ink” is calling to me… LOVE Elizabeth Hunter’s writing (one of my favorite series is her Elemental Mysteries series)… and the H’s name is OX! OMG, I’m having Wolfsong withdrawals. Going to download the sample. And it’s supposed to be an opposites-attract, slow burn. YES! Font laugh or I’m going to make you watch it. I got my eye on you. What’s your favorite flavor of pie? If I want to be indulgent and not care about calories: pecan pie (especially Cracker Barrel’s version with chocolate chips). DECADENT. “Healthy” pie? Apple, of course. And ANY kind of berry pie. ALL THE BERRY PIES. I’ve done my Korean drama time for the year. I watched Full Metal Alchemist dubbed in Spanish with English subtitles. Not kidding. Just getting home and trying to decide what to read. No pie, but I did get a cupcake!! ROFL Seriously, In dubbed in Spanish and English subtitle? I watched that back when Adult Swim had it and loved it. Also, it was dubbed in English. 😛 I absolutely loved the story! Bev – not a cartoon. The film version. They had a film version of Full Metal Alchemist? Huh. Was it as good as the cartoon? Is it just me or does it seem like we have gotten a little quieter lately? I noticed. People have been busy, I guess. Yes, Tessa. On Netflix. Okay, okay, Japanese! But it had subtitles. Ugh. Does your K drama have subtitles? Or is it dubbed into English? Does Maryse keep adding to this list? It seems longer every time I look! Tessa – it was released Dec 2017. And guess where scenes were shot? Volterra, Italy!!! Made me think of Twilight the whole time. The Volturi from Volterra. Heehee. It makes it even more like a book. Maybe we should have a first day of spring party. We can have pie and hot dogs without the peanut butter. I like applesauce sandwiches. Is that weird? Doesn’t the applesauce make the bread soggy? bev babe OMG I totally forgot about that screen! Now I want a cupcake…. Says the lady with the peanut butter. Kooloo, that show does great reaction shots. its FLT…don’t forget… Haha, says the girl without her kindle handy. It’s not easy being optimistic when you have thousands of unknown miles ahead of you and an army of zombies on your heals. Bev, I also love Kdramas. They are really addicting. Some of the Kdramas I enjoyed are ‘Boys over flowers’, ‘You are beautiful’ and ‘kill me, Heal me’. I think you will enjoy ‘kill me, heal me’! FLT: “Emmie Elliot lasted three breaths in the old bookshop, her measured exhalations stirring dust motes that danced in the afternoon light streaming in from the large display windows that looked over Main Street.” -Ink, Elizabeth Hunter. MichelleS. It sounds like heaven. I love peanut butter and honey sammiches, so YOUR version of applesauce would be perfect, too. It’s March Madness, my favorite time of year, so I didn’t get much reading done today, but I’m still enjoying my vamps! Do you keep the skin on or off do you salt them? I keep the skin on… and just cook them a little less. I often over-cook them too, and sometimes I under-cook them (which is kind of worse). It takes practice but sometimes I get them almost perfect. I just load ’em with cheese and my favorite spaghetti sauce and devour with glee. I can’t believe I’m going to say this, but I never played the game. I did watch the cartoon so I probably should play the game. 🙂 I’ll watch it sometime next week probably. Young that is so cool. We need a kdrama sub group within this larger book group. We will slowly bring some others over. I did watch Boys Over Flowers think it was my third kdrama. It was like crack but I’m not even sure if I liked it or not I just couldn’t stop watching it. I haunt dramabeans now so I’ve heard of heal me kill me but have yet to watch it. Right now I’m watching radio Romance I watch the first couple episodes of the Great tempter but I’m really looking forward to pretty Noona who buys me food. The trailers just look so Charming. But I have to find a way to balance work kdramas and reading because I do miss my reading even if it is a slump. Best nickname and gift ever. Healthy? Pumpkin! There’s a reason I like the feasts of Thanksgiving and Christmas. I love peanut butter and honey. I don’t have it that much anymore, but as a kid, it was THE BEST! What do you mix the applesauce with? Peanut butter or something else? Not apple butter I hope. I can’t stand the stuff. Horror scares me, but pie I love. Favorites….hmmm…..lemon meringue. I love pecan too. Let’s have a pie group. We can home our baking skills. And can I say randomly reading one of the zucchinis post was scary. With all the talk of picking the skin off or leaving it on but not knowing what you were talking about. I’m joining bev’s pie group. Other than donuts, pie is my favorite dessert. Kooloo- I have to try making those margarita cupcakes. Yummy!! Wegmans makes zucchini and other veggie spaghetti. No fuss, easy meal. “Is this all of them?” Marco studied the crowd of lanky drummers milling around the undersized room we’d been assigned and then checked the time on his phone. Drumline by Stacy Kestwick. So far, so good and it’s KU which I’m trying to stick to only reading right now. Pie- would be warmed pecan pie with vanilla ice cream. There’s healthy pie?? Does a fruit tart qualify? Anything fruity can be considered “healthy”. I love the idea of learning how to make Kahlua Cream Cheese. I could make it so the only real sugar was from the Kalhua and then pretend it’s healthy and sugar-free. My favorite dessert is Tiramisu. YUM! Next time I go to Universal Studios, I’ll try to remember. 🙂 I’ve never been to one. Not a huge pie fan, but good old fashioned apple pie is ok. And maybe coconut cream. Zucchini noodles – if you sauté them they will get mushy. If you like them fresh, don’t cook them at all. Use narrow side to make thin noodles. The sauce will “cook” them. I leave skin on. Tessa – I love Tiramisu! Coffee flavored anything, really. I made Emmeril’s fancy version once. Wasn’t worth the trouble. I’ll just eat it at restaurants. No more attempting it myself. You don’t mix applesauce with anything! Just slather it on the crusty bread. (I put butter on everything, but that’s just me. Even Nutella). Just try it. You’ll love it. That’s a great idea Michelle let the sauce cook it!!! !